There are tons of monumental buildings erected around Indonesia thanks to the Dutch who heavily influenced architecture in the country, most especially in the city of Bandung. The city has a long history that contributed to the development of the world through its colonial buildings, one of which is the Gedung Sate. The Gedung Sate is one of the most stunning and elegant buildings with unique architectural style inspired by Indo-European structural design. The building surely leaves a lasting impression with its mature symmetry of arrangement against the open spaces of the Gasibu Park found just across the street from it. In addition to its Bandung art deco building style, it also provides a dignified and sacred image for the people of Bandung. It was in July 1920 that the Dutch East Indies Government ordered the foundation to construct some departments in the newly appointed capital city of Bandung. One of these was the Bandung Gedung Sate. Four years after the start of the construction, the Gedung Sate was completed to be one of the grandest buildings in the Netherlands East Indies. Today, it still remains the most prominent symbol of Bandung. Plans of the building were only considered after the Dutch government decided to move the capital of the Netherlands East Indies to Bandung from Batavia. The design of the building is the creation of Architect Jr. Berger. In order to fulfill his designs, the building needed about 2,000 laborers in total. Among the thousands of workers, 150 were Cantonese Chinese while the rest were carpenters and stone carvers from different parts of the country. The first stone that was laid for the foundation of the building was set down by Ms. Johanna Catherina Coops, Bandung Mayor B. Coops’ eldest daughter and Ms. Petronella Roelofsen, the representative of the Governor-General of Batavia. Upon its completion, the famous Dutch architect Dr. Hendrik Petrus Berlage mentioned that the Gedung Sate Complex along with other Civil Government Agencies is a masterpiece. While there were many Dutch colonial buildings in Bandung, the Gedung Sate Complex remained a standout among them all: a stunningly elegant monumental building that combined Western and Eastern architectural style. Gedung Sate is actually only a small portion of the Complex of the Central Office of Civil Government Insatansi. Former residents called the marvelous building Gedong Bebe but it eventually became popular with the name Gedong Sate until it was finally concluded as Gedung Sate. Many claim that its extraordinary roof ornaments was the origin of its name as it looks much like a stick of sate (also known as satay), which is a famous Indonesian snack. It was also the first building that acknowledged actual construction techniques and technology in Indonesia carried over from the Western world. The building previously served as the core of the Dutch East Indies administration as well as the office mansion of the then Governor-General of the previous colony. 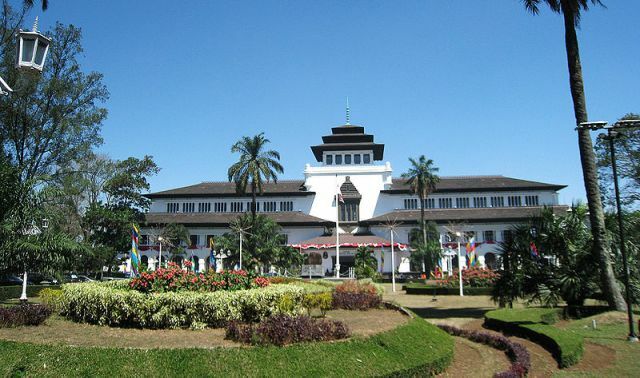 Not only does the Gedung Sate exist as proof of the colonial area center in the capital of Bandung but it also provides a sense of patriotism as Independence Day is celebrated here annually. The Sate building has been a witness to the history of the city and has deep symbolic value to the people of Bandung, who see it as one of their most important landmarks.